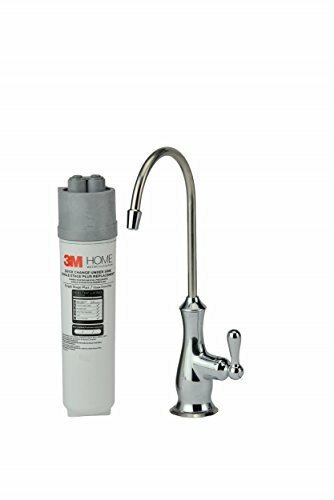 Keep your water clean and safe with the 3M water filter high performance system filter. It will help to reduce select VOCs, as well as lead and other sediments from your water. It filters up to 750 gallons of water and lasts up to six months. It will also work to keep the water clean of rust and dirt, as well as eliminate any taste of chlorine. This drinking water filter comes in a compact, space-saving size. With just a 1/4 turn, the filter can quickly be replaced to keep your water clean. High performance drinking water system, single stage, includes dedicated faucet for better tasting, healthier water to keep you and your family safe. One filter does the work of a traditional 2-stage under sink water filtration systems.